Gambling has always been big at real money casinos in Atlantic City and racetracks across the Garden State. New Jersey has just risen the stakes this month as the second state in the country offering legal sports betting. This follows the month of May where it has been reported that casinos in the state took in $22.37 million in gross revenue on just its online real money casino business. In a post on PlaySlots4RealMoney.com, these revenue figures confirmed that New Jersey’s online casinos posted their second-best month ever. 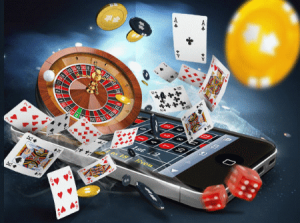 With the anticipated expansion of sports betting to an online format in the not-to-distant future, revenue gains for the overall online real money casino business could explode. Sports betting in the state became legal on June 11. Monmouth Park wasted little time in getting its sportsbook up and running as the only land-based location in New Jersey right now where you can legally bet on the games. A few Atlantic City casinos and other New Jersey racetracks could have their sportsbooks open by football season with more to follow in the coming months. The plan for an expansion into online sports betting calls for the majority of current iGaming operators to add this feature within the next five months. Most iGaming operators in the state have ramped up their efforts to start offering sports betting for the 2018 football season. This would give anyone 21 years or older that is physically in the state of New Jersey access to these legal betting options. Delaware is also scrambling to become the second state in the country after Nevada to offer online sports betting to its residents and in-state guests. When it came to real money gambling online in New Jersey in the month of May, Golden Nugget was identified as the market leader with $8.6 million in revenue. Its online properties include Golden Nugget Online Casino, Sugar House Online Casino and Betfair. “Golden Nugget continues to outshine its competitors and prove its success is here to stay.” Borgata, Tropicana, Caesars and Resorts online casino business has remained consistent in total revenue against previous months. However, all four are expected a big boost to the bottom line once online sports betting is added to the mix. Borgata’s online casino revenue in May was $4.14 million. Tropicana brought in the third-most revenue in the state at $3.4 million followed by Caesars ($3.32 million) and Resorts ($2.91 million). When it came to the amount of revenue these companies generated with their online poker offerings in the month of May, Caesars led the way with $770,000. The total online poker revenue in New Jersey during May was $1.93 million as noted in this post. www.PlaySlots4RealMoney.com is one of the top sources of information for iGaming news and online-casino promotions in online gaming markets regulated by the United States.